Continuing with the discussion on XML, today we will talk about XML Schema collections. For a complete list of related topics, please refer here. If you are looking for a detailed course on XML Schema Definitions, please start here. In this article we would be taking about the DDL support for creating XML Schema collections. We will also talk about what needs to be done, if one of the schema definition (xsd), needs to be changed. Before we get on with the DDL for creating a schema collection, lets quickly figure out where in the Database are these collections created. Since AdventureWorks database already has some SchemaCollections defined, lets have a look at these. In the AdventureWorks database browse to Programmability->Types->XML Schema Collection, we would find of the Schema collections being used with the database. 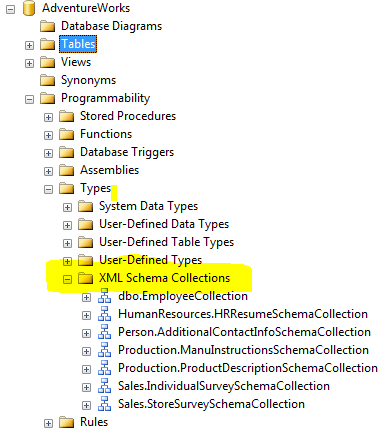 Each, SchemaCollection mentioned in the list contains at least one XML Schema definition, which would be used by some XML column in one of the tables in the Database. Additionally these can be used with XML variables and parameters. SQL Server supports Creation/deletion/modification of the SCHEMA COLLECTION objects using the following T-SQL syntax. To modify the XML schema collection, we would need to take care of all the dependencies. In our example, the Book Column in Table BookDetails is currently typed against the Books Schema collection. Attempts to modify the schema (add element or attribute) will not fail, but removing an element from the schema or modifying the data type of the elements might generate an error. When inserting or updating the XML contents in the table, the final XML would be validated against the schema declaration in the collection. If any mismatch is found, an error will be generated. In SQL 2005, there is strict type validation is performed. There are no LAX validations allowed in SQL 2005, while in SQL 2008 LAX validations of Any, AnyType and AnyAttribute is allowed. We will talk more about these in subsequent posts. Associated with any xml type parameter or column. Specified in any table constraints. Referenced in a schema-bound function or stored procedure. Attempts to drop an SCHEMA COLLECTION while in use will generate an error. Specified collection ‘Items’ cannot be dropped because it is used by object ‘dbo.BookDetails’. To Drop an existing XML SCHEMA COLLECTION, we need to perform the following steps. Recreate the SCHEMA Collections for other schemas. In the next post I will talking about XML Indexes in SQL Server 2005 and SQL Server 2008. Till then happy learning.